Nothing like a service pack to fix all your problems, or in the case of SCCM 2012 SP1 create some new ones for you. After running a SP1 upgrade I was wondering why my OSD process was failing when attempting to install applications. ‘Site Component Manager failed to reinstall this component on this site system. 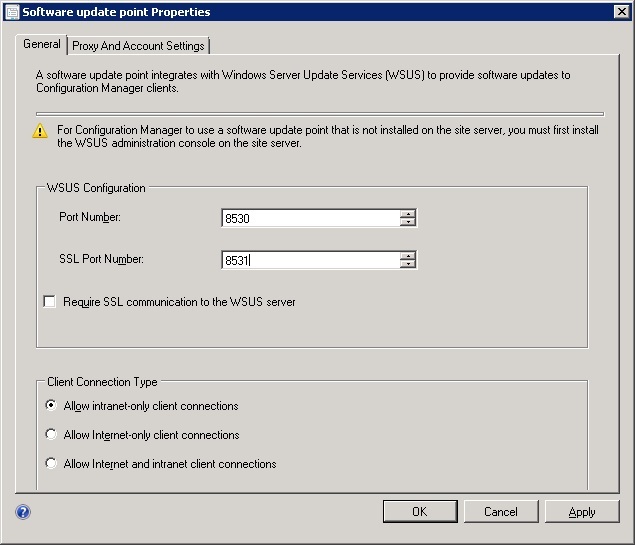 It seems that my WSUS install has been reset from port 8530 (see this post) to port 80. To remedy the problem go to the Administration workspace. Choose Site Configuration>Servers and Site System Roles. Right click the Software Update point and select Properties. Change the ports back to 8350 and 8531. Pretty cool info here with this tool you found. I led me to the reason WSUS wasn’t working at all from any client. I was doing an in-place upgrade from 2008 R2 to 2012 R2, First thing was the default domain policy overwriting the log on as service right for the WID service account, second was Windows 2012 R2 actually failed to let me know WSUS 3.0 has to be uninstalled prior to upgrading (had I done 2012 first then 2012 R2, 2012 would have notified me). So at this point I have 2012 R2 up and running and wow it’s looking great but not really, WSUS 3 is all broke so I go to uninstall couldn’t. I couldn’t even force removal of the service and delete the registry entries, that turned out a disaster. The only solution is to reformat and I saw even Microsoft makes note of this as a known bug in the prerequisite checks during an in-place upgrade to 2012 R2 . Just wow! OK so after all that, I’m back up and running but my clients still aren’t connecting to WSUS. I had no idea WSUS 4 uses ports other than 80. I think it’s great, I added a cert to the ssl binding on 8531 and adjusted the GPO to point to the SSL bound site and I was back in business. Always hated how WSUS took over IIS in previous releases. Sometimes I’d like it all to work like it’s supposed to but in the end nothing ever does. Ouch! Bryan thanks for the story. Sometimes the simplest of tasks turn into major headaches. Glad you got this sorted in the end. It happens with me also, but not after upgrade but after making Site Reset ! !